For the latest instalment of the Brands Report, we quizzed the class of 2013 on the brands they use in cocktails. Don't forget to check out the results for gin, vodka, rum, Tequila, liqueurs/bitters, Scotch, World Whiskies, Brandy, aperitifs, digestifs,Champagne, beer and cocktails. Creating new cocktails is part and parcel of being a top bartender, and so is mastering popular and classic drinks.Consumers are comforted by the familiar and the Dry Martini, Mojito, Margarita and Cosmopolitan are like old friends. As with most cocktails there is more than one story about their creation – just ask Google. 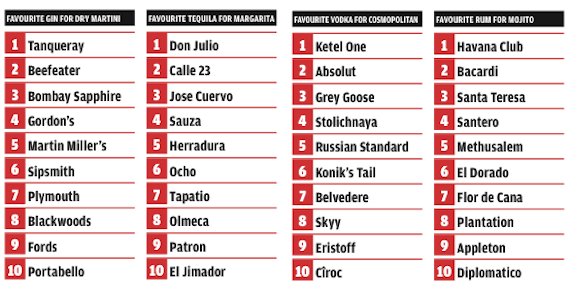 The Cosmo is the baby on the list, said to have been created in the 1980s by Miami-based bartender Cheryl Cook.